Recently, Facebook, the world’s largest online social networking company, contacted APR to discuss launch of two of their new products in Pakistan. APR was subsequently chosen as the PR partner for two very important announcements for the local market, which included introducing the ‘Blood Donation Facility’ and ‘Profile Picture Guard’ features. APR’s scope of work included media outreach comprising of coverage in print, online and broadcast media for both the products. APR delivered fully to Facebook’s expectations and obtained extensive coverage, which included articles in major newspapers and two one-on-one interviews in both online media and in print. We also secured broadcast media coverage classified as Breaking News. APR was recently tasked by retainer client Coca-Cola to provide PR support for its latest marketing campaign, the FIFA World Cup Trophy Tour. This was the first time in its history that the FIFA World Cup, possibly the most prestigious prize in world sport, came to Pakistan. APR managed all print, broadcast and online media outreach and the digital outreach with bloggers and major sports influencers. In addition to this, APR also managed all content creation with the Coke digital team and was responsible for coordinating with all football invitees which included both the national men’s and women’s teams and the Street World Cup kids team. Despite all the challenges, APR delivered well beyond client’s expectations, generating a PR value of close to the PKR 100 million mark for a campaign that lasted only a month! Print coverage of the Trophy Tour day exceeded 100 print appearances, more than 40 TV channels stories, over 7000 tweets and it was the number one trending topic on Twitter for over 12 hours. APR CEO, Zohare Ali Shariff was also among the 16 privilieged people who brought the Trophy to Lahore, Pakistan on a special Coca-Cola jet from Chiang Mai, Thailand for one day on February 03, before it was taken to its next destination Almaty in Kazakhstan. The team at Asiatic Public Relations Network (APR) has always believed in the power of education and uses its unique position as an ally to influence its clients, some of the biggest companies and brands in Pakistan, to invest in education. Most of our partners are already keen to allocate funds and effort to develop and support education, but it is a matter of being ready with a feasible, attractive idea at the right time that is a good fit for the company’s specific mission. Even though this in itself is a proud achievement, team APR wanted to go beyond this. The state of Pakistan’s education is dismal beyond words. The magnitude of what needs to be done can be overwhelming, but like the philosopher Lao Tzu said, “Every journey starts with a single step”. APR recently turned 25 and on this happy occasion, we wanted to celebrate in a different way. We decided we wanted to do more for education. And so at our annual Retreat a proposal was floated for sponsoring poor children’s education through Pakistan’s leading education NGO, The Citizen’s Foundation where employees were called to fund a child’s school expenses for one year. We have immense respect for the work The Citizens’ Foundation is doing hence APR announced that for every employee who takes on the responsibility of sponsoring a child for one year, the company and the CEO, separately, will match the donation. For every child an Asiatic came forward to sponsor, 3 children are receiving free education at TCF as per the 2 to 1 matching pledge. Tetra Pak, the world’s largest food processing and packaging solutions company, regards the recycling of used beverage cartons an integral part of the way it conducts its business all over the world. In Pakistan, Tetra Pak has been working with Green Earth Recycling, the largest plastic recycling company in the country, to collect and recycle a certain percentage of used beverage cartons every year. To document this ongoing activity, Tetra Pak Pakistan called upon its PR agency, APR, in 2016 to produce a short documentary on the recycling of the paper component of used beverages cartons. And now APR has produced a second short documentary for Tetra Pak, which covers the recycling of the aluminium recovered through recycling. Our work included initial conceptualization, filming, editing, post production and final product delivery. Mr. Anwar H. Rammal, Chairman of APR, was honoured with the Lifetime Achievement Award at the annual PAS (Pakistan Advertisers Society) Awards 2017 held in Karachi on April 15, 2017. A standing ovation was accorded to Mr. Rammal as he came up on stage to receive the award, by hundreds of event participants, including advertising and public relations industries professionals, corporate leaders, media moguls, celebrities, heads and teams of advertising, digital and PR agencies and still others. Anwar Rammal is a person who dared to dream and had the courage to transform the dream into reality. His advertising career began in the 1950’s, when after initially working for a couple of multinational agencies in Pakistan, he moved to London in 1960, where he joined a leading advertising agency, W. S. Crawford. Later, he was transferred to the Karachi office as the agency’s Creative Director. Then in 1963, he, along with a friend, launched Asiatic Advertising, starting modestly with a staff of 6 and growing to over 170 employees. Asiatic soon became one of the most respected and highly acclaimed advertising agencies in the country, delivering best-of-breed creativity, while maintaining sound business ethics. In year 2000 it was acquired by a leading global advertising agency, J. Walter Thompson, better known as JWT now, with whom Asiatic had successfully partnered since 1989. Anwar Rammal also co-owns Asiatic Public Relations Network, better known as APR, of which he is also the Chairman. APR was launched in 1992 after many years of incubation at Asiatic Advertising. Affiliated with Hill+Knowlton Strategies, APR has successfully grown to become one of the largest public relations and corporate communications companies in Pakistan, serving top local and global clients including Coca-Cola, Emirates, EBM, Haleeb Foods, Jubilee Life Insurance, LG, MCB-Arif Habib, Mondelez, Pakistan Poverty Alleviation Fund, South Asia Pakistan Terminals Ltd, Tetra Pak and Ufone. A retainer agency agreement has been signed with Khaadi with October 01, 2017 as the commencement date. The scope of work includes ongoing strategic counseling; strategic writing; CSR strategy counseling; issues and crisis counseling; and media outreach & management. Khaadi is Pakiatan’s leading textile brand, which first opened its doors in 1998 in Karachi, Pakistan offering customers kurtas and loose fabric made from hand-woven fabric. It then expanded into Prêt (Ready-to-Wear), Unstitched (Fabric) and Man (Eastern Wear). Over the years, Khaadi has introduced a number of new Concepts including Khaas (featuring exclusive and limited-edition pieces), Kids (for 2-12 year olds), Accessories (jewelry, stoles and handbags) and Home (featuring furniture, bedding and bath items). Khaadi entered into the international arena in 2010 launching an online store in Pakistan in 2014. The company continues to expand by opening several retail stores in smaller cities of Pakistan. Continuing a long-standing tradition, APR’s management planned and executed Annual Retreat 2017 in September for all its employees, from Karachi, Lahore and Islamabad offices, who traveled to Khanpur Dam, from September 08 to 10, for a 3-day off-site Retreat that combined learning, teambuilding, sightseeing, competitions and fun experiences. Khanpur Dam is a dam located on the Haro River near Potowar Plateau and the town of Khanpur, Khyber Pakhtunkhwa, Pakistan. During the Retreat, the Annual Awards were also announced at a Gala Dinner. The team also participated in various other activities including water sports, quiz competitions, cricket, and a learning trip to Taxila – one of the oldest cities in Pakistan and a historic site belonging to the Indus Valley Civilization which flourished from about 3300 BC to 1300 BC, with the most notable sites that have been discovered being Mohenjodaro, Taxila and Harappa. AkzoNobel signed on APR on retainer basis starting May 15, 2017. APR’s scope of work includes ongoing counseling, media outreach, media engagement, crisis counseling and trend reporting. AkzoNobel is a leading global paints and coatings’ company, and a major producer of specialty chemicals. They supply essential ingredients, essential protection and essential color to industries and consumers worldwide. Backed by a pioneering heritage, their innovative products and sustainable technologies are designed to meet the growing demands of fast-changing planet, while making life easier. Headquartered in Amsterdam, the Netherlands, AkzoNobel has approximately 46,000 people in around 80 countries, while its portfolio includes well-known brands such as Dulux, Sikkens, International, Interpon and Eka. APR entered into a retainer agency agreement with TAF Foundation (TAFF) starting August 1, 2017. The scope of work includes development and execution of a comprehensive PR strategy, ongoing PR counseling, key messaging development, content development for social media, media outreach and management, strategic writing, issue & crisis management and PR support to other marketing initiatives. TAFF was established in 2010 as a charitable organization for the less privileged. A key initiative of TAFF is a Vocational Training Institute (VTI) for the structured skills development of less privileged women, with the aim of producing a much needed skilled workforce and creating sustainable livelihoods. With TAFF-VTI ensuring placement of graduates along with providing training, it is an excellent initiative directed towards socio-economic empowerment of the marginalized. Recently APR CEO along with other team members carried out a full-day media training at Avari Hotel, Lahore, for Tetra Pak executives and executives from 2 of its customers (Shakarganj Foods & Haleeb Foods – also our client now!). Tetra Pak had requested for the training as given the current negative public sentiment regarding packaged milk, it is felt necessary that spokespersons of milk processing companies should have proper media training before appearing on TV talk shows and giving interviews to print media. Haleeb Foods Limited has appointed APR as their official PR and communications agency in Pakistan starting March 15, 2017. The scope of work include ongoing PR counseling, media outreach and management, strategic writing, issue & crisis management and PR support to other marketing initiatives. Over the years, Haleeb Foods Limited (HFL) has become a popular feature of family life throughout Pakistan. The first product launched to the many by HFL was Haleeb milk and today HFL has expanded its business to include GROAUR, CREMYUM, Dairy Queen, Tea Max, Just Fruit, Tropico, Fun Milk, and other dairy products to its production and packaging lines. HFL has the peculiarity of being the first company in Pakistan to use Tetra Pak’s novel packaging formats, Tetra Brick Aseptic (TBA) and Tetra Fino Aseptic (TFA). Apart from its extensive nationwide distribution network, covering both urban and semi urban areas, Haleeb Foods is also serving international markets in Central Asia, Middle East, Australia and Europe. Following a pitch process in which several agencies were evaluated, MCBAH has signed on APR as its PR agency with effect from March 01, 2017. This is yet another feather in APR’s cap, adding to its portfolio of blue-chip retainer clients. On July 15, 2015, a young American woman, Cassandra De Pecol (Cassie), departed on an international expedition to travel to all 196 Sovereign States of the world, in an effort to break a Guinness World Record, while promoting World Peace through the International Institute of Peace through Tourism (IIPT). Cassie was in Pakistan, her 191st destination from December 13 to 17, 2016. Her programme in Pakistan was largely organized by APR to support her host in Pakistan, PATA (Pacific Asia Travel Association) Pakistan Chapter. It included talks at leading universities – the Institute of Business Administration (IBA) in Karachi, the Beaconhouse National University (BNU) in Lahore and COMSATS in Islamabad. Another talk was organized at a Rotary Club Karachi dinner. Meet ups with the social media community in Karachi and Lahore and a meet the press event in APR Karachi offices was also organized. Extensive print, broadcast and online media coverage was obtained. Additionally, PATA organized Cassie’s meeting with Mayor Karachi, Waseem Akhtar, and planting of an Araucaria sapling with him, a luncheon with the travel trade and sightseeing in Karachi and Lahore courtesy of Sindh and Punjab Tourism departments. APR is no stranger to promoting Pakistan internationally. Its previous work in this field has included participating in a soft image of Pakistan international campaign with its international affiliate, Hill + Knowlton Strategies, organizing B2B interaction between Turkish and Pakistani steel industry players, facilitating Japanese businessmen in understanding the dynamics of the Pakistan market, organizing a conference in London for investment in Pakistan’s equity market, counseling multinational clients doing business in Pakistan, and even training Ministry of Information officers before their posting abroad in Pakistan’s foreign missions. For the first time in its 9 year history, Coke Studio engaged APR to conduct all PR for its Season 9. Our work started off with pre-season hype building, continued through the Season’s 8 weeks run, and followed through with post-season coverage. APR generated a total PR value of over Rupees 254 million in print, electronic, online and social media, which was over 3 times as much as was achieved for the previous Season 8. The coverage included 417 print media appearances, 23 television stories, 160 blogs, over 121 million impressions on twitter and over 44 million appearances on instagram. Tetra Pak, the world’s largest food processing and packaging solutions company regards the recycling of used beverage cartons as an integral part of the way it conducts its business all over the world. In Pakistan, Tetra Pak has been working with Green Earth Recycling, the largest plastic recycling company in Pakistan, to collect and recycle a certain percentage of used beverage cartons every year. To document this ongoing activity, Tetra Pak Pakistan called upon its PR agency, APR, to produce a short documentary, from initial conceptualization to filming, editing, post production and final product delivery. APR has produced over 25 corporate documentaries for its various clients over the years, in Pakistan and in Afghanistan, and working within a fairly tight budget, it produced the recycling documentary for Tetra Pak, which has subsequently been shared globally online. 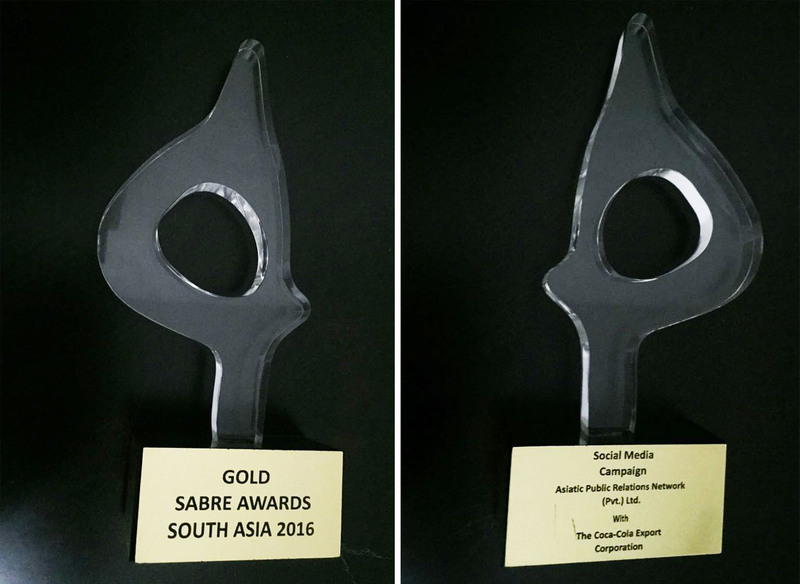 APR has been declared as the winner of the category Social Media Campaign, of the 2016 Gold SABRE Awards South Asia. The prestigious SABRE Awards for Excellence in Public Relations Programming, attract close to 5,000 entries globally each year and provide the premier showcase for the best that public relations has to offer. APR has won the Award for its entry: The Coca-Cola Book Bank, a unique PR activity conceived and executed by the agency for its client, Coca-Cola Pakistan, and which targeted collecting donation of textbooks from the public, to be given over to students of schools operated by The Citizens Foundation (TCF) and other NGOs for less privileged children. The campaign was actively promoted on the social media and had received an overwhelming response. “We are happy, honoured and humbled on receiving this award, which is an independent third-party endorsement of our creativity and capabilities, and which is a victory not only for APR but for the PR industry of Pakistan,” stated Zohare Ali Shariff, the CEO of Asiatic Public Relations Network. 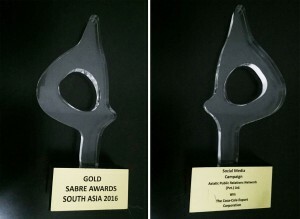 The annual SABRE Awards are given out by the Holmes Group, which is headquartered in USA. The Group is dedicated to proving and improving the value of public relations, by providing insight, knowledge and recognition to public relations professionals. It delivers against its mission by providing the most sophisticated reporting and analysis on public relations trends and issues. The Group portfolio includes the holmesreport.com website, a comprehensive source of knowledge and information about the public relations business, a free global email newsletter, featuring insights and coverage of the global public relations industry on a weekly basis, the Global PR Summit which takes place every year in Miami, the Agencies of the Year research, being the most exhaustive analysis of PR firm performance across the world and the world’s largest public relations awards competition, the benchmark World PR Report, and the SABRE (Superior Achievement in Branding and Reputation) Awards separately for North America, EMEA, the Asia-Pacific region and South Asia. Following a pitch process in which several agencies were evaluated, Reckitt Benckiser (RB) has signed on APR as its PR agency with effect from March 01, 2016. This is yet another feather in APR’s cap, adding to its portfolio of blue-chip retainer clients. Organized by the Digital Empowerment Foundation, New Delhi, India, the Social Media for Empowerment Awards 2016 received more than 266 entries from across the globe. Hence, emerging as one of the short-listed finalists is definitely a an achievement for APR. The Gala Event to announce the winners will be held in New Delhi in mid-March. We are hoping we are among the winners and this becomes a bright feather in our cap! Asiatic Public Relations Network (Pvt.) Ltd. (APR) hosted their Annual Corporate Dinner on January 30, 2016, for their clients, media representatives, bloggers and other social media activists and other stakeholders. The primary objective was to meet with all our business associates socially, exchange thoughts and spend quality evening together. The event was held on the lawns of the Alliance Francaise. A red carpet at the entrance welcomed guests, and led to a mingling area where live music in the background was being played by a sitarist and table player. While guests met the APR executives and each other, mocktails and lights snacks were served. Guests were also invited to record their comments on a message board set up in the area. After some time the guests were ushered into an adjacent open area where a stage and theatre style seating had been set up, for the 50 minutes duration entertainment that had been organized. The evening was a dedication to Urdu literature and the entertainment was dramatic readings from the works of renowned Urdu writers, Ismet Chughtai and Quratulain Hyder. Following this the guests invited for dinner, which was laid out in the adjacent lawns. Altogether it was a serene and gentle-paced evening which all the guests thoroughly enjoyed and appreciated. .
South Asia Pakistan Terminals Ltd. has recently appointed APR as a retainer agency. SAPT is a subsidiary of Hutchison Port Holdings Limited (HPH), Hong Kong, which itself is a subsidiary of the multinational conglomerate, Hutchison Whampoa Limited (HWL), the world’s leading port investor, developer and operator. The HPH network of port operations comprises 319 berths in 52 ports, spanning 26 countries throughout Asia, the Middle East, Africa, Europe, the Americas and Australasia. SAPT will be Pakistan’s fourth container terminal and the first and only deep water terminal capable of berthing the world’s largest container ships. Presently such ‘mother’ ships do not come to Pakistan owing to their size and most of our import and export cargo is shipped on smaller container vessels which then transfer the containers to the mother ships at ports like Jebel Ali in the UAE. Cadbury Pakistan signed on APR on September 01, 2015 as its PR agency. Given the growth of the food industry in Pakistan and the worth of traditional PR for the image building of the company, it’s a positive development in terms of not just supporting their presence on social media but also the traditional mediums. The scope of work for the client includes; strategic and ongoing PR counseling and support for social media, strategic writing, issue management, and conceptualizing and execution of ground level events. e2e has been APR’s retainer client since 2014, being given media and PR support on an ongoing basis. Similarly, considering the magnitude of social media and the need of a two way communication, even for a B2B business, it was deemed necessary to have an active presence on social media through revamping the already existing presence on Facebook and Twitter. As a result, e2e SCM decided to expand its scope of work and assign the task of developing strategies for its Twitter and Facebook pages to interact proactively with the target market. Therefore, these value added services were included in the contract on April 20, 2015 with the already existing PR support thereby giving the client more mileage and significant outreach. APR impact will be conducting two days training for Coca-Cola Beverages Pakistan Limited (CCBPL) Public Relations Officers (PRO’s) scheduled in the first week of November 2015. These PRO’s will be deputed in each territory where CCBPL Products plants are located. All the CCBPL Territories Operations Managers (TOM) and Territory Commercial Managers (TCM) will also be the part of this training. Members of CCBPL Public Affairs and Communications Department along with CCBPL Security managers will also attend this training. Emirates, a global connector of people, places and economies, has commenced a nonstop service to Multan, the airline’s sixth destination in Pakistan. Flight EK 630 from Dubai arrived at Multan International Airport on August 1st, 2015 at 22.00 Multan time. On board the inaugural flight was Khalid Bardan, Emirates’ Vice President Pakistan, Mian Iqbal Hassan, President of Multan’s Chamber of Commerce and Industry and Mian Muhammad Khan, Senior Vice President, the Multan Chamber of Commerce & Industry. Service to Multan, Pakistan’s 5th largest city by population, commenced with four weekly flights operated by a Boeing 777-300 in a two-class configuration – 54 seats in Business Class and 310 in Economy Class. Event and media management for the launch was done by APR. Nestle Fruita Vitals, the premium beverage brand of Nestle, worked with APR to rebuild consumer trust following a couple of incidents in which consumers discovered mold when juice cartons were opened. Although this was due to packaging being damaged and only happens in about two cartons out of a million, the incidents were reported by the consumers on social media and got huge traction. APR Impact conceived and produced a Public Service Message for Nestle to highlight the Best Practices followed by the Company to ensure healthy and safety of its consumers. This infomercial was directed by Ismail Jilani of IJ Films, who has previously worked with APR on several other projects including the CCBPL women empowerment documentary. Coca-Cola Pakistan organised a creative activity on International Literacy Day to collect a donation of old books from citizens, for donation to The Citizens Foundation. For this purpose a Coca-Cola truck was converted into a Mobile Book Bank, which traveled the whole day to different parts of the city, where citizens were able to donate their assortment of books, in return for chilled complimentary Coca-Cola. The activity was undertaken in association with TCF, leading higher education institution SZABIST and the Karachi Press Club. To generate greater public participation in this noble cause, several leading social media activists also gave strong support by vigorously promoting the activity on different social media platforms. APR team along with the brand’s activation team accompanied the Coca-Cola truck while collecting books from educational institutions, offices and even homes. This was an original idea conceptualized and executed by APR. e2e Supply Chain Management Limited has engaged APR as its retainer PR agency, starting from July this year. APR will be providing a range of services, including media outreach, B2B PR, media relations and event management as and when required. Formed in 2006, e2e is one of Pakistan’s leading providers of end to end logistics services, specializing in international and local air / ocean freight and associated supply chain management solutions that include warehousing. The company is known for its sound financial capability, extensive air & sea cargo experience, dense nationwide road transportation network, best in class management / team and state-of-the-art IT systems which have earned e2e the honour of becoming the fastest growing company in Pakistan in 2011. The Dawood Public School, one of the most reputed and oldest all-girls schools in Karachi, has signed on APR as its retainer PR agency. The agreement came into effect from August 01, 2014, after the school reopened at the end of the summer holidays. APR’s scope of work principally covers image building of DPS, issues and crisis communication and management. With this new client, APR has broken new ground and has entered the hitherto untapped education sector. Dawood Public School (DPS) is an institution that offers quality education to over 1500 girls. Established in 1983, the school was developed to provide a very high standard of education to girls to empower them for their future. Initially, the school only catered to students from Nursery till Grade 5, but it has progressed right up to ‘O’ Levels by 1989, and has been achieving 100% pass rate since then. Furthermore, each year some of the students achieve regional and world positions in different subjects as well. DPS encourages students to actively participate in co-curricular activities and social programmes. APR’s training and development division, APR Impact, organized its inaugural training workshop for retainer client Coca-Cola Beverages Pakistan Limited (CCBPL) on August 18, 2014. The workshop, held at the APR Impact Training Centre, was attended by the CCBPL Public Affairs and Communication Director Zafar Abbas Jafri, Communication Manager, Rauf Hameed, Public Affairs Manager, Imran Dogar and PAC executives, Zara Iqbal, Amna Zafar and Saad Sarfraz. APR CEO, Zohare Ali Shariff was the trainer for the workshop while APR Director Client Service, Mustafa Hussain delivered his expertise too. The workshop was highly interactive and encouraged dialogue to formulate a proactive PR strategy for CCBPL. The trainers kept the audience involved throughout as they drove along the proceedings with total command, influencing their perception and understanding of PR. Youth empowerment is a key CSR focus area for The Coca-Cola Export Corporation, Pakistan, as it is for Coca-Cola globally. All over the world Coca-Cola undertakes various activities for the youth, aimed at supplementing formal education with imparting wider learning that will be of value to the youth in their future lives. In Pakistan, as in many other countries, the priority concern for students in universities is their future after graduating. There is ample research which reveals that a sizeable percentage of university students are deeply worried about what they will be doing in practical life, with few having worked out a clear career path. This is not untypical, as at that age, youth is constantly evaluating various options, still deciding what really interests them, and exploring unknown areas. With this in mind, Coca-Cola held the EMPOWER Lecture Series programme in colleges and universities across Pakistan. APR coordinated with the schools, colleges and universities and organised the lectures. APR was also signed on as its retainer agency by Habib University, starting October 01, 2014. Habib University, a project of the Habib Foundation, started with its first batch this year, and aims at being a preeminent institution of higher learning, dedicated to enriching individual lives and engaging society through teaching, research and service. The scope of work includes ongoing PR counselling, creating awareness of the University’s liberal arts programmes, image building, media relations, issue & crisis counselling and communication, Key Opinion Leaders outreach, event management and training. APR has been primarily brought on board for image building and publicity in order to establish Habib University as one of the prominent names in the education sector of Pakistan. APR’s sustainability advocacy platform, TBL – Triple Bottom-Line has been revived, given the huge business potential in the field of CSR and sustainability. TBL has started off on a new and exciting project, with the support of retainer client Coca-Cola. TBL is in the process of developing a corporate volunteering programme as part of its Sustainability Advocacy Platform. This will bring a formalized model of volunteerism to Pakistan which enables companies to send employees to volunteer their time and expertise in beneficiary institutions. Corporate Volunteerism has become an important aspect of Corporate Sustainability at an international level, as companies are able to offer much needed valuable assistance to not for profits. The areas of assistance are limitless: report writing, training, teaching children and adults, administration, ICT, social media campaigns – and can be matched to the beneficiary institution. The platform will be developed as an online portal. After registering, employees from companies will be able to volunteer their skills in the relevant area of interest. Beneficiary institutions will be able to identify areas in which assistance is required. TBL will act as the facilitator and match both volunteers and beneficiary institutions according to their needs. The project is being led by a highly qualified consultant, Nazish Shekha. She has a Post Graduate Diploma in International Environmental Law and a B.Sc Environmental Science degree from the UK, besides a B.A degree from Karachi University in Education, Economics, and English Literature. EBM was established in 1967 as the first manufacturer of wholesome, hygienic packaged biscuits in Pakistan. For over 45 years, EBM has been a symbol of trust and confidence for consumers, making it the leading biscuit manufacturer of Pakistan. EBM is the first biscuit company in Pakistan to have achieved ISO 14001, ISO 9001 and HACCP certifications. Its Peek Freans master brand has been a household name throughout the country for several decades and also enjoys the internationally acclaimed Superbrands status. Today, as for many years already, Peek Freans Sooper remains Pakistan’s best loved and most consumed packaged biscuit. APR was previously EBM’s retainer PR agency from 2004 t0 2007. Now APR has been reappointed by EBM in the same capacity with an enhanced scope of work. We are grateful to EBM for once again placing their trust in us and can only say that we are rearing to go! Headquartered in Karachi, Byco is an emerging energy company engaged in the business of oil refining, petroleum marketing, chemicals manufacturing and petroleum infrastructure logistics. With 225 outlets across Pakistan, the Byco Petroleum Marketing Business is the one of the largest Oil Marketing Companies in the country, engaging numerous local businesses and in the process creating much needed employment for over 10,000 Pakistanis. Byco’s 2 refineries with a combined capacity of 155,000 barrels per day make Byco the largest refiner of crude oil in the country. On March 27, APR conducted a media training workshop for 11 Byco senior executives, drawn from its 4 companies. The training covered several key areas like Introduction to the Media, Dealing with the Media, Interview Fundamentals and Crisis Communication and Management. A ‘life-like’ television interview was also simulated as part of the day’s programme. The Japan External Trade Organization (JETRO) Pakistan office, having previously worked with APR successfully, has now engaged APR for a 7 month duration market research project relating to the volume zone / BOP market. Further details of the project cannot be shared! But APR’s scope of work includes market research, data collation, analysis and reporting. APR recently organized a comprehensive 2-days duration media training workshop in Islamabad for top management and other senior executives of Lafarge Pakistan Cement Limited. The training modules included amongst others, Introduction to the Media, Dealing with the Media, Interview Fundamentals, Messaging Development, Crisis Communication and Body Language. The Byco Group was founded in mid-1990’s, with the vision to pioneer the change in the energy sector of Pakistan. Byco is Pakistan’s emerging energy group engaged in the businesses of oil refining, petroleum marketing, chemicals manufacturing and petroleum logistics. It is headquartered in Karachi. The marketing network supports retail outlets in more than 80 cities all over Pakistan and is an emerging leader in oil marketing sector of our economy, with a diverse and highly skilled workforce of approximately 800 employees shared among all Byco companies. The Byco Group has now taken on APR as their public relations agency to enact a comprehensive PR and communications strategy to support its business. Coca-Cola Beverages Pakistan Ltd. (CCBPL) was established in 1996, following the acquisition of locally franchised bottling operations throughout the country. In 2008, Coca-Cola İçecek acquired 49% share in CCBPL and took over the management. CCBPL has 6 plants and 13 warehouses throughout the country and serves a population of more than 182 million. It is a significant player in the growth of Pakistan’s economy since it is one of the country’s top foreign direct investments in FMCG (Fast Moving Consumer Goods) business and is one of the major corporate tax payers in Pakistan. With CCBPL also becoming an APR retainer client, APR’s relations with Coca-Cola have further strengthened. The Coca-Cola Export Corporation (TCCEC) Pakistan & Afghanistan is already a retainer client of APR since 2003. The Pakistan Microfinance Network (PMN) traces its beginnings to 1997 when a group of microfinance practitioners laid its foundation as an informal platform for coordination, exchange of ideas and peer learning. Since then PMN has grown significantly and is now recognized locally and globally as the national association for retail players in Pakistan’s microfinance industry. Registered with the Securities and Exchange Commission [SECP] in April 2001 under Section 42 of the Companies Ordinance, PMN is a member driven network with a vision to expand access to formal financial services in Pakistan. PMN has engaged APR for complete event management of a 3 days international microfinance summit, to be held in Islamabad from July 8 to July 10. APR’s scope of work includes creative design work, strategic writing, collateral production, logistics, arranging entertainment artists at the inauguration ceremony, organizing a concurrent Exhibition, event management and also website development, which APR is executing through its group company, The Brand Crew. The Pakistan Business Council (PBC) is a business policy advocacy platform, established in 2005 by 14 of Pakistan’s largest private-sector businesses / conglomerates, including multinationals. Today its membership comprises 42 companies. The PBC believes in research-based advocacy efforts, supported with evidence of best practices in economies at similar level of development as Pakistan. The Pakistan Economic Forum (PEF) is an annual event which is hosted by the PBC. It brings together the best available intellectual capital in the country, to debate on major issues which are confronting Pakistan. The panels of the Forum, headed by their own Chairs & Co-Chairs and comprising of sector specialists, debate various issues and come up with pragmatic recommendations. These recommendations are then shared with a wide audience in the form of PBC position papers. The 2nd Edition of the PEF is planned for April 2013. APR has now been engaged by the PBC to carry out a comprehensive media advocacy campaign to highlight the work of PBC/PEF and bring stakeholders (particularly decision-makers) attention to bear on the recommendations made for ensuring the future economic growth and development of Pakistan. The Karachi Literature Festival, organized by the Oxford University Press, Pakistan, has become a prominent and much-awaited annual event and a landmark in the cultural history of Karachi. It is the first event of its kind in Pakistan and had received enormous national and international acclaim since it was first held in March 2010. Since then the KLF has grown rapidly and over 20,000 visitors thronged the 4th KLF held from February 15 to 17, 2013. About 200 Pakistani and international authors, writers, poets, literary critics and publishers were present at the 4th KLF. The activities included creative writing workshops, debates/discussions, lectures, Mushairas (Urdu poetry recitals), a book fair, book launches, readings, signings, interactive story-telling for children, film screenings, music and theatrical performances. The world as we know is evolving rapidly. Communications and information technology especially have revolutionized the way we receive, process and respond to a vast amount of information from myriad sources. Traditional PR practices too need to evolve with the fast-changing environment and the equally evolving perceptions of the audiences that the practice of PR attempts to address. Recognizing all this, APR formed a Business Strategy Group of its senior executives, led by the CEO, to review the company’s present business, deliberate on present and future opportunities and come up with recommendations for the consideration of the company’s board of directors relating to the future direction the company should be taking. The 7 persons forming the Strategy Group were each tasked to research and present on one key aspect relating to the company’s business. All were further required to develop their ideas on possible directions / areas for the company’s business expansion. Then, on a given weekend, the Strategy Group got together to review the task-area presentations and discuss and debate the way forward. The Strategy Group meeting came up with some hard-hitting facts, as the company’s weak areas were also indentified and measures were discussed to address these. Then, the Group spent considerable time in deliberations on the proposals for future direction. At the end, consensus was reached on the proposed new areas for the company’s business to expand into. A set of recommendations was drawn up and later a detailed Report was prepared and submitted to the Board of Directors. Through this introspection and brainstorming exercise, APR intends to ensure that it not only remains a leading communications and PR agency of Pakistan, but it works to becoming even stronger in the future, in terms of its capabilities and services aligned to the evolving needs of its clients. Emirates Group signs on APR as its new PR agency in Pakistan! After a competitive pitch process and detailed evaluation, Emirates Group has selected APR as its new, retainer PR agency in Pakistan. “Emirates Group” means collectively Emirates, Dnata, Dnata World Travel, any wholly or partly owned subsidiary of any of Emirates, Dnata, Dnata World Travel, and any branch, business or division operated by any of the foregoing, as from time to time amended, and “member of the Emirates Group” means any of the foregoing. Emirates, which enjoys great popularity with air travelers in Pakistan, as in the other countries it serves, is continuously expanding its offerings. APR looks forward to working with its new client in these exciting times! Japan External Trade Organization (JETRO) is a non-profit official trade and investment promotion agency, working under the aegis of the Ministry of Economy, Trade and Industry (METI), Govt of Japan. JETRO has been operating in Pakistan for more than five decades. Since its inception, JETRO Karachi Office has been has been making endeavours to promote trade and investment and strengthening bilateral relations between Japan and Pakistan. JETRO has now selected APR to plan and execute a range of services relating to an upcoming visit of a Japanese Business & Investment Delegation to Pakistan. The delegation, comprising of about 20 business leaders, most of whom visiting Pakistan for the first time, will arrive in Karachi and also visit Islamabad and Lahore. Their visit coincides with EXPO Pakistan, the largest annual trade fair held in Pakistan, in which JETRO will have a large Japanese Pavilion for Japanese exhibitors. During their stay in Karachi, the visiting delegation will visit EXPO 2012, hold a networking session in a local hotel with Pakistani business leaders and visit various infrastructure and other projects. APR will plan and execute a comprehensive print and electronic media outreach activity, support JETRO in the networking event, design and produce print communication materials and render other services as required. Earlier this year, APR had provided similar services for a visiting delegation of Turkish Steel Exporters Association. APR’s primary task for the Turkish delegation was to research and create a database of over 100 Pakistani importers and end-users of steel products, and then arrange a comprehensive, full-day, one-on-one B2B Meetings Session for individual Turkish companies of the delegation. Jubilee Life Insurance, a subsidiary of Aga Khan Fund for Economic Development (AKFED) and one of the leading life insurance companies in Pakistan has signed on APR as its PR agency. This is the first time ever that Jubilee Life has taken on a PR agency. APR looks forward to the challenge to leveraging PR to add value to its client’s business.